Spending a full day in Arrecife recently, we were able to catch two arts events, as one was held at mid-day in The Cabildo at one end of the promenade and the other at eight o’clock in the evening at Cic El Almacen, up near The Gran Hotel at the other end. The day being warm and sunny, we spent the hours in between strolling around Charco de San Gines and enjoyed some long and lazy fine-dining on the world’s greatest pizza, a Bianca (glazed pear and walnuts), washed down by a pint, a Tia Maria and a cappuccino at the Divina Italia. We were regally entertained by un-intrusive buskers plying their trades for the coins dropped into their hats by those on shore from the massive cruise liners we had seen docked just round the coast line. A gentle singer guitarist performed acoustic songs from the sixties and circus artists, like clowns and stilt walkers, all straggly hair and red noses, paraded along the walk way around the water. By now it was late afternoon and the schools were obviously out as groups of young teenagers arrived for their canoeing lessons, and to watch them paddle out across still water in a dozen or so vessels, weaving their way out to sea around all the scores of small boats moored in the harbour, made for a languid but colourful site. As they disappeared under the bridge, out on to the ocean, the setting sun warmed our faces as we read our newspapers for an hour or two. We spent a blissful couple of hours in this area that seems to have benefitted greatly from the coming of the cruise liners and the region’s re-gentrification continues at a pace. It will be interesting to see how plans, already in progress, for a similar development affect our own town of Playa Blanca. The first event of the day we had attended at The Cabildo was now beginning to seem like a distant memory but that was more likely due to the sun, food and drink than to any lacking in the exhibition. Of course, we seem fated to fated to remain unable to write a review without mentioning some misadventure we have along the way. The little leaflet that is the monthly arts and cultural agenda is collated by that department in The Cabildo and this event was advertised in that leaflet as the inauguration of an exhibition to be showing for the next few weeks in the Cabildo. The blurb in the leaflet promised a rare opportunity for us to have a look at some of the most significant pieces of art, held in different venues within the Cabildo, that are not often placed on public display. The Cultural Area of the building, however, has put together this new display, created by art historian Estefania Comego Quinteco, that includes pieces made and engraved at The Taller De Linea on Lanzarote. The collation also includes work by artists such as Jose Manuel Broto, Juan Munoz, Pedro Cabrita Reis, Cristina Iglesias and Susana Solano and her work with Gonzalo Gonzales. When we had first wandered into the Cabildo a year or so ago we had been amazed that the general public were given access to what is a fairly important building full of some fairly important people and some fairly important art works and perhaps even political artefacts. Each subsequent visit, though, has seen a slight increase in security measures until these days we are asked to show passports and / or residencia cards and to pass metallic objects we might be carrying under the x-ray search machine. The security officer at the front desk, and the receptionist you can approach only when you have been through this still fairly quick procedure, perhaps have more tasks to undertake these days than previously but nevertheless we were disappointed to be met by blank stares when we showed them the agenda and asked precisely where in the building today’s events might be. The receptionist was apologetic but said she knew nothing about it and phoned up to another floor to make enquiries for us. She then put the phone down and said the event was not being held here but was at Castillo de San Jose up near where cruise liners dock. Off we set, hot foot, and took two junctions up to the Ikea at the end of the motorway and pulled up, Starsky and Hutch style, into the castle car park. We leapt out of our vehicle, me bouncing over the bonnet in best David Soul fashion, and raced into the little tourist office. The young man behind the counter was as mystified by our request as had been the receptionist at the Cabildo but very helpfully offered to phone the tourist information office for us. However, he could then only shrug his shoulders apologetically and say that the lady on the other end of the phone had assured him the event was, indeed, being held in The Cabildo. So, at beyond the speed of sound we accelerated back to the future, or at least back to from whence we came. It being lunch time, there had been a shift-change at the Cabildo, but nevertheless, the second receptionist knew no more about such an event as had the first, and again she made a phone call to a colleague elsewhere in the building. This time light was shed, and the receptionist apologised with such a lovely smile that I would have forgiven her anything as she told us to go on up to the third floor. We breathed a sigh of relief but as soon as we stepped into the lift (I don’t do stairs) confusion took over when we saw buttons saying (in Spanish) sotano, (basement), planta baja (ground), primero (first) and Segundo (second) but for third, button was there none. With a resigned sigh we stepped out on the second floor and were greatly relieved to see, hung on the walls of the corridors, paintings ascribed to some of the artists mentioned in the blurb. However, we had obviously missed the inauguration as we were the only people wandering down these of ´halls of fame´! Nevertheless, that gave us the opportunity to peruse at our leisure the art works on display, and I was most struck by how ahead of their time so many of these artists were. Cesar Manrique, in particular, seems to have been a graphic designer even before that term was coined and many of his works on display here had been employed as logos for various projects, campaigns or commemorations. That could also be said of other artists on display such as Jose Manuel Broto, Juan Numoz and Pedro Cabrita Reis. All these works, were emblematic of Lanzarote, inviting us to study and scrutinise an art as if it were a 3D, to find a camel, or a volcano or the sun almost hidden within, but there was a greater sense, in seeing all these paintings together, of how these artists had moved the island forward towards its current standing in the modern world without sacrificing anything of its historic identity. As we left the building we were, perhaps, feeling a little underwhelmed by the quantity of the work we had seen but we were absolutely enthusing about its qualities. Our excited chat came to a sudden stop, though, when we heard a young lady’s voice from behind yelling ´Ola´ at us. We turned around to see the lady hurrying towards us before introducing herself by asking if we spoke Spanish. When I shamefully replied ´not one single word of it´ and Dee responded with ´un poco´ or some such, the girl smiled and said, Áh, English,´ and proceeded to talk to us in a more accurate rendition of our own language than we are able to give. 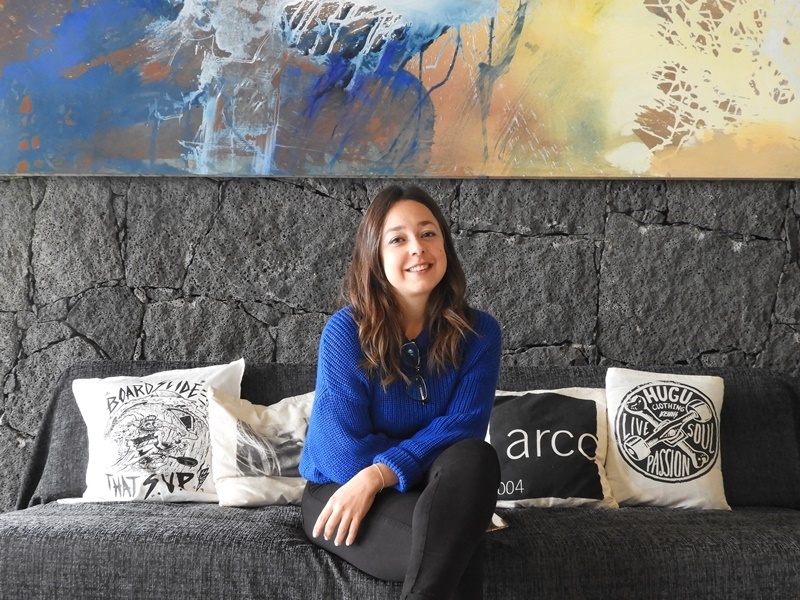 She said she had noticed us looking at the art work, and that she would like to introduce herself as its curator, Estefania Camejo Quinteco. The cultural agenda leaflet describes her as an art historian, but she described herself to us as a freelance curator. She seemed delighted by our response to ´Insularia, sixty years of art in the Cabildo building´ (advertised under the snappier title of Grabado En Linear) but we hadn’t the heart to tell her we were disappointed by the relatively few works on display. However, as I was wondering whether or not to mention that, she said something about the works being dotted all over each floor of the building. We kept our counsel and said nothing about the staff’s lack of awareness about it all, as her enthusiasm didn’t deserve to be deflated. Estefania then mentioned, in passing, that after being commissioned to curate this commemoration there had been a sharp intake of breath when she suggested actually holding it in the public building, and that the subsequent logistics of installation, too, had been difficult. She remained adamant, though, that these artists and their works were deserving of such prominent and privileged display. She spoke of how hard it was in their day, and similarly for present day artists, to earn a living on the island, and how important their work was and is to the growth of Lanzarote . Then she gave us an informal invitation to an add-on event at this same venue, pencilled in for mid-day on Saturday 30th March, at which she will give a guided tour and talk around the exhibition. She then said goodbye, adding that she hoped she might see us there. She most certainly will, and then, hopefully, we’ll get to see all the art work we had missed on this visit, by artists such as Mario Delgado and Juan Gopar among many. So we passed the rest of the afternoon in the soporific manner described earlier, before setting off for the evening event at Cic El Almacen, where we arrived at just about seven thirty for an eight o’clock kick off. That gave us just time for a drink and a bite from the tapas menu. We ordered, for Dee, a goat and goat’s cheese kebab whilst I went for an offering of pork on a sweet potato base, and we each had a beer. Neither dish looked as it had in our imagination, perhaps, but instead was exquisitely presented and tasted absolutely delicious. Service was quick and friendly in the small restaurant area where every table was taken, and next time we will have the full platters and not have a lunch beforehand. Miguel, of Lanzarote Information, tells me that, when he first arrived on the island, El Almacen was a dilapidated shell, but he knew the story behind it, that Manrique and friends opened it as a cool, “arty” hang out where you could watch a movie, see some art, grab some tapas etc. and above all be challenged. There has been a refurbishment in the past year or so and the venue is now, he feels, returned to exactly what Cesar and chums hoped it would be. When we had spoken to Estefania earlier about coming to this ´conference´ tonight she told us she knows the presenter Arminda Arteta, and said it was likely she would present in Spanish as that would be the first language of 99% of the audience. We stepped into the theatre and managed to grab a seat in the middle of the second row from the front, which offered us a great view of the podium from which Arminda would speak and of the huge power point screen hung at the back of the stage, which would so help our understanding. I recall that art critic Robert Hughes once employed the phrase ´the shock of the new´ in his book and TV series of that title, in the nineteen eighties that changed the way people thought about modern art. I was reminded of that phrase, as Arminda spoke about the work of Pancho Lasso, a Lanzarote artist closely associated with the Vallescas School of the surrealist movement. Lasso gave expression in his work to his own artistic commitment by creating avant garde art work. He is credited with sharing his aesthetic values and views of the island’s natural artistic grandeur with the young Cesar Manrique and others, and Arminda Arteta covered all this ground and beyond in a wide ranging talk. She had not only curated this on-line collection but also had written her own informative and informed notes to deliver to accompany it. From our position it was interesting to see the front row, (reserved for artists and dignitaries) nodding their heads at many of her arguments. She spoke, into a radio mic, of a number of artists who worked alongside one another or who were sufficiently aware of each other to produce comparative work. In mentioning all this, Arminda echoed a sentiment that Estefania had brought up in our lunch time conversation about how important it is that great works of art are somehow enabled to ´speak to each other´ and it was fascinating about how both these arts historians seemed to share that passion. As Arminda Arteta told us about Pancho Lasso and his aesthetic vision of Lanzarote and how he wanted art to be spoken about in everyday language rather than in the hallowed tones of academia, I was reminded that the English Lakeland poet, William Wordsworth, felt the same way, as he described eloquently in his poem The Table Turned. He sought to preserve the beauty of his part of England against the coming of machinery and technology threatened by The Industrial Revolution, gathering pace only sixty miles South of where he lived. Nevertheless, as Arminda clearly illustrated how these artists she had collated had exerted such a major influence on Lanzarote, I found myself thinking about an idea that has fascinated me for many years. I recall having an interesting debate on live tv with Canadian novelist Margaret Attwood about whether artists shape their landscapes or their landscapes shape them, and tonight’s talk by Arminda also put me in mind of the enclave of songwriters and poets who gathered in Austin, Texas in the mid sixties to the late eighties. Guy Clark, Townes Van Zandt and their acolytes re-wrote the past myths of the Lone Star State, re-built its musical present and re-imagined its future status as the hub of creative arts it has since become. The way Arminda wove this narrative certainly engaged a front row that included the island’s Director Of Art And Culture, Oscar Sanchez. Similarly spellbound was the rest of an audience comprised of established and aspiring artists and others, like me, with precious little artistic ability, but who simply love the arts and what they can achieve socially and politically. It is a great credit to Arminda that she kept us all so engrossed in her down-to-earth style and with her obvious love of her subject. The story of the arts has shown us often enough how today’s avant garde becomes tomorrow’s traditional and both Estefania’s exhibition and this ´lecture´ of Arminda’s demonstrate perfectly how the fusion of ancient and modern can so often explode into thoughtful, provocative and exciting art and how drawing on tradition to create contemporary work was so accurately labelled ´the shock of the new´. We arrived at the closed-for-business Cabildo at mid-day on Saturday 30th March, to be greeted on the steps by a smiling young lady who introduced herself to us as Estafania Comejo. You will know from a previous feature on these pages (or you can check in our archives for ´Art Ancient and Modern´) that a couple of weeks ago my wife and I were given some misinformation about the inauguration of Grabado En Linea, put together by Estefania to highlight work by artists such as Jose Manuel Bruto, Juan Munoz, Pedro Cabrita Reis, Cristina Iglesias, Gonzalo Gonzalez and Susana Solano. As we left somewhat dejectedly after that visit, Estefania suggested we might enjoy taking a closer look at the art work in a fortnight’s time at her scheduled talk about some of its most interesting aspects. We were to be joined on this guided tour, it seemed, by another ten or so people and what a joy it was for all of us. There is nothing more exciting than listening to an expert enthuse eloquently about their particular field of expertise. This exhibition is of works that celebrate Lanzarote’s landscape and cultural history, most of them emanating from funded workshops held in the nineteen nineties. The works are part of collections held by the various departments of the Cabildo that are not always shown to the public. For further information and detail type Grabado En Linea into your search engine and then copy what comes up on to a new word document. You can then hover over the information on that document and press translate, and although the result is a little bit computer-speak it offers a much clearer understanding, in your own language, of what the collection is all about. The tour took a languid couple of hours that turned out to be quite magical. Estefania loves the arts and spoke enthusiastically of the colours, strokes, perspectives and social context of the items and the artists who produced them. She didn’t present her knowledge to us as a closed door beyond which there was nothing left to discover, but instead she offered what she knew to open the door for us into a world of informed wonderment. Her own preference seemed to be for the colours and vibrancy that so epitomise Lanzarote but I was also intrigued by some of the more sombre pieces, some almost of dark monochrome. One of the larger paintings of the more than fifty on display reminded me of Too Heavy A Sky, a poem written twenty years ago by British poet Pam Mckee. The painting showed a landscape seemingly compressed, flattened and diminished by towering, portentous and threatening clouds. Although I have seen skies like that here on Lanzarote they rarely deliver the rain they seem to be warning us of, and I was intrigued about whether or not the artist had deliberately subdued the landscape in his work and if so, what point was he seeking to make. Esefania was delivering her thoughts in Spanish, and rightly so as that was the first language of our fellow pilgrims on this journey. Some of those travellers became quite animated, asking questions and debating certain aspects of the art with its curator. Estefania seemed to enjoy that cut and thrust and there was a constant buzz of chatter as she led us across three floors of the building, up and down long, wide corridors and stopping at each painting to tell us more about the artist and his or her work. The vocabulary might not have magically translated itself for me, nor for my wife Dee, but we both recognised the passion for the subject matter and the sheer joy of sharing that passion with like-minded people. She and the paintings made me think, and that is all I ask of art. As the tour came to a conclusion and the rest of the party gave her their thanks and drifted away, I wondered whether Estefania might be able to spare a few minutes for a brief interview. I knew from our previous meeting that she speaks perfect English (perfecter than what mine is anyway !) and so I asked her politely if we could record a chat. The three of us sat round a table in the strangely quiet historic building in which the security guard was now the only other occupant. There are many things I should have asked her that you might have been interested in. How old is she,….I´m guessing still in her twenties. Is she from Lanzarote,….again I guess so, but I should have asked where she acquired her obviously broad education in the arts and in languages,…but I was much more interested in the modesty that, despite her obvious education and depth of knowledge, had her describe herself simply as ´a freelance curator´ when ´art historian´ would seem more appropriate. How far is it possible to spread that love, though? I wonder if a love of Lanzarote artwork can be conveyed to Russian or American art lovers and, indeed, even whether art that is parochially produced can it be universally loved? So to bring these strands of conversation towards a conclusion I look for a place to tie the knot, and I realise that Estefania has talked about how the art speaks for itself, and speaks for its place of origin and, indeed, for its creator. I am reminded of something said at the previous night’s inauguration of the Almacen 1974 exhibition that served also as the launch event of the 100 Years: Lanzarote And Cesar events. It had been suggested that art also speaks to art, and I ask whether Estefania agrees with that point. I am interested in her viewpoint, and I reflect on a work that we had looked at on her tour, that was painted in a vivid and somehow quite violent red. There have certainly been periods in modern history across Europe when such a colour would have been taken as representing a political persuasion, but on hearing Estefania’s tone when talking about the piece, I had not sensed her speaking of the work holding a political viewpoint. If I had translated correctly in any way I thought she had said, earlier, during her tour, that in the era when the work on show was produced there was a desire to communicate among the artists and a receptivity among the public that created a real energy. Is Estefania implying that either art, or society has changed in the last few decades? This young lady has, even in what was only intended to be a cosy little chat, been thoughtful, and stimulating. Her passion burns, not only for arts and artists but also for the communities from which they emerge. I pre-empt my final question by suggesting that as a freelance collator, with all her life skills and professional talents, she would be in huge demand in England by artists and galleries alike. ´I think the people who came here today for this tour are now somewhere talking about the art and perhaps are in a different mood,´ she says, wistfully. It is certainly true, I think, that when any of us who attended today’s guided tour next approach or bump into new art work we will at least have some new points of references with which to work. There is a follow up to the Grabado En Linea exhibition, also curated by Estefania that will open at the Cabildo on Tuesday May 29th and will run through until Saturday July 28th. This one collates works by artists, including Manrique, of course, and others such as his nephew Carlos Matallana, Juan Gopar and Mario Delgado. Estefania has prepared a showing that seeks to strengthen the intangible ties that binds us to landscape as a form of artistic expression. 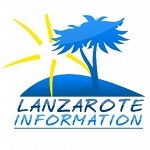 The exhibition will be open from Monday to Saturday from 10.00 am to 2.OO pm and it might be worth looking out for any special announcements on Lanzarote Information or on the Cabildo’s own web site in case Estefania might deliver a similar guided tour as that which we attended. If that happens we hope to see you there, because we certainly would make every effort to listen again to this ´freelance curator´ who manages to show us the real world and then open our eyes to the imagined. Because I prefer not to research artists who might be unknown to me before I encounter their work, or interview them, I only discovered a feature about her on another web site several days after, or so I thought, completing this piece. I feel it is better to come to know artists and their art organically, a method Estefania might or not agree with. I can identify one song, for instance, as having led me into years of studying Texan and Mexican music. The song, I Want The Real Thing, about the writer’s search for artistic integrity and authenticity, was written by Chip Taylor, who also wrote two massive hits from the nineteen sixties, Wild Thing and Angel of The Morning. He is a passionate and compelling interviewee when discussing his work and that is all it takes for art to spread,….creative artists, exciting work and an advocate as proud and persuasive Chip Taylor, or Estefania !